This review is about item#9344484. It may be very bright, but it will not be in focus if it is not close enough to stick to the product. It may be such a high magnification, but it is difficult to use. This review is about item#9344493. 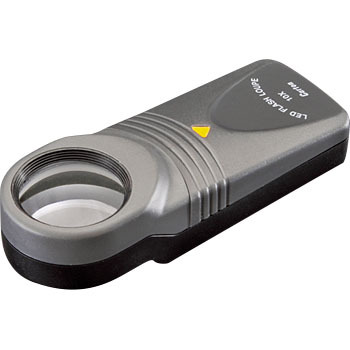 The visibility is better than the conventional loupe with light, It is excellent in cost performance. Purchased for gifts for family. I was surprised that it was very easy to see. I think that it is completely different from cheap ones. I also borrowed it to use for checking the precision foundation, but it was very easy to see. I think that it is still best if there is a step in the lighting brightness. Presbyopia is essential for checking the model number of IC etc. Additional purchase for purchasing parts on the go. Purchase genuine products including confirmation of performance difference. I opened the package and thought that it was not worth nearly twice as long as LED lighting, but I recognized the difference in sharpness by looking at the letters through the lens. Again, I felt the lens difference. I bought it for checking the presence or absence of burrs after microfabrication. If it is 15 times, the distance at which the focus is in focus becomes severe, but it will be easy to focus on thanks to the transparent plastic guide. This review is about item#09344493. Surface analysis after processing, easy to check and convenient!